B.C. 's Ministry of Transportation has reopened the Coquihalla Highway (B.C. Highway 5) between Hope and Merritt after a collisions caused an afternoon closure, as snow continues to pile up across the South Coast. DriveB.C. posted an advisory just before 2 p.m. on Tuesday, and reopened the northbound lanes about an hour later. But it took two more hours before the southbound lanes were cleared. Meanwhile, more than two dozen school districts and several major universities on B.C. 's South Coast are closed Tuesday as snow pummels the region for the third day in a row. 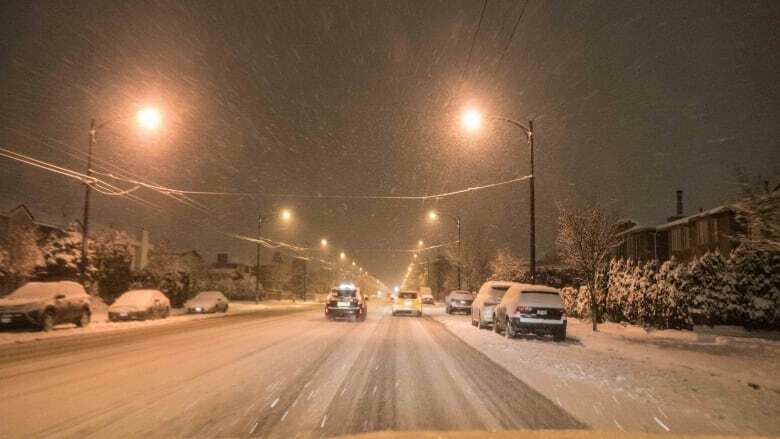 Almost every school district in the Lower Mainland, including Vancouver, Surrey and Abbotsford — three of the province's largest — are shut. Only schools in Fraser-Cascade (School District 78) are open Tuesday. The University of British Columbia and Simon Fraser University are also seeing closures. The entire southwest corner of the province is under a new snowfall warning, with up to 25 fresh centimetres expected in some eastern areas. 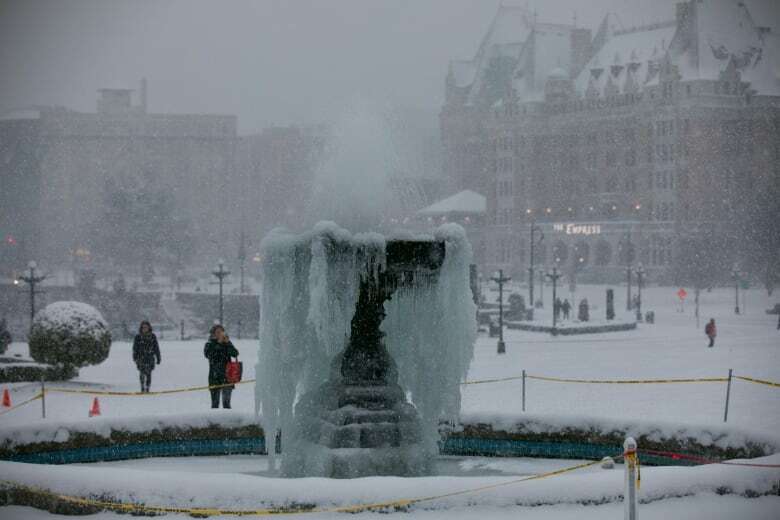 Environment Canada said the snowfall is expected to taper off late Tuesday afternoon. The snow began Sunday and picked up again Monday afternoon, continuing overnight. 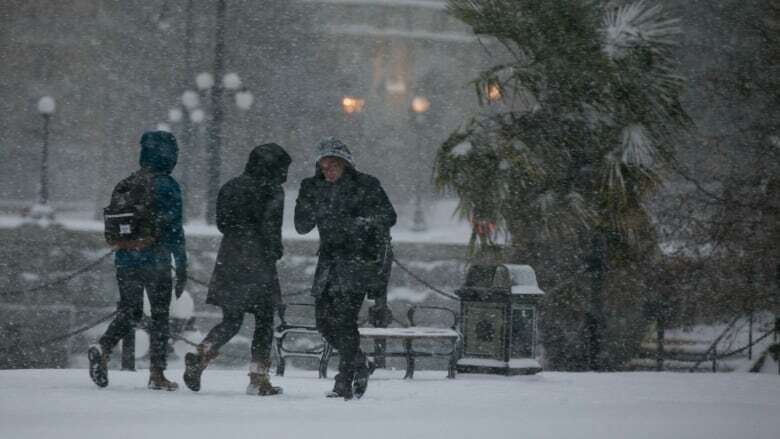 Elsewhere in B.C., Environment Canada says a winter storm lashing the southeastern corner of the province could blanket some areas with as much as 35 centimetres of snow before the system passes late Tuesday. In northeastern B.C., an extreme cold warning has been issued for the Peace River region, where wind chill values of –40 C are forecast around Fort St. John. 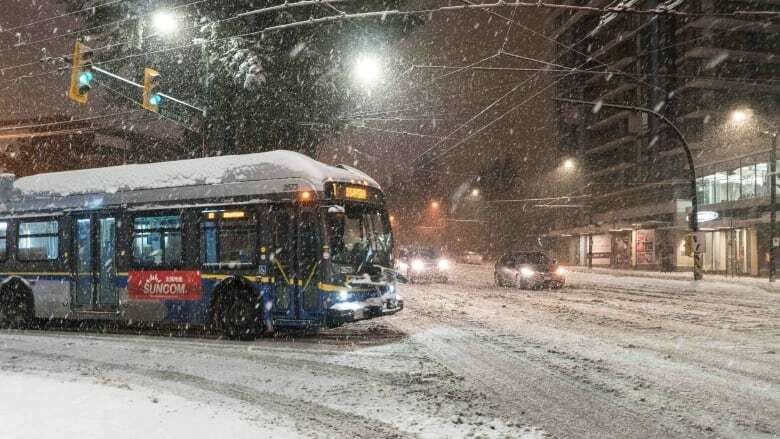 Monday's commute in Metro Vancouver likely had many SkyTrain passengers grinding their teeth, with long delays and crowded platforms due to de-icing nightmares combined with a lack of TransLink staff, but Tuesday's rush was markedly calmer. Spokesperson Chris Bryan said trains were only at 50 per cent of normal service levels, but the authority was "fairly confident" it was going to be a better situation at around 80 per cent of normal service Tuesday morning. "We'll have more trains out on the system, we'll have a lot more capacity on the system and we've called out additional staff," said Bryan. Every train on the Expo and Millennium lines is being run by a staffer, rather than automatically, because of the weather. Bryan said there simply wasn't enough staff available Monday to keep things running smoothly. Smaller buses have also been running at a slower pace Tuesday due to slippery roads. Late Monday, a SkyTrain full of passengers stalled along the Canada Line in Richmond due to ice on the power rail. "The train couldn't get power, so the train failed," Bryan said. "We're really apologetic." The passengers were trapped for more than two hours before a second train was able to take them off.